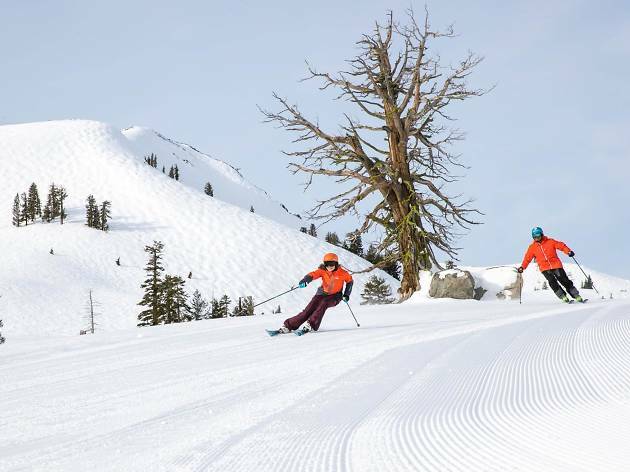 8 hours 30 minutes from L.A.
Squaw Valley Resort, one of the largest ski areas in the country, is comprised of two mountains: Squaw Valley and Alpine Meadows. The mountains are a ten-minute drive from each other, but Squaw provides free shuttles between the two all day, and a lift ticket will work at both. The resorts offer joint access to 6,200 acres of terrrain across six peaks, 43 lifts and over 270 trails, and they attract approximately 600,000 skiers a year. Squaw isn't far from the infamous Donner Pass, so it gets a heavy dump of snowfall almost every year, often exceeding 40 feet per winter. If carving through all that fresh powder isn't your speed, take the scenic aerial tramway up 2,000 feet to High Camp, at an elevation of 8,200 feet, where visitors can drink, dine, shop and even roller skate. Lift ticket pricing: $89–$179 for adults (ages 18–69); $72–$149 for young adult (ages 13–17); $57–$119 for children (ages 5–12); $72–$149 for seniors (ages 70 and up).